This chart covers the week commencing November 19th to November 26th. Ninja is back on top this week after last week's leader falls from the chart. As the Dota 2 Kuala Lumpur Major draws to a close, the channels covering it begin to experience massive drop-offs. 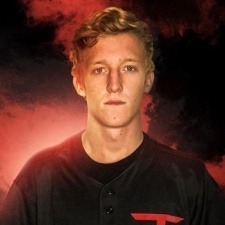 Twitch streamer Tfue experienced another big leap this week and is now in second place, less than 600k views behind Ninja himself. While 600k is a lot of views, it's barely a fraction of what the Fortnite megastars see each week. YouTuber Nick Eh 30 is third after a 39 per cent increase in views this week. Fourth place has a new challenger this week - YouTube channel FACEIT. The UK-based channel organises game tournaments and provides coverage of other esports events taking place around the world. League of Legends name loltyler1 is in fifth this week after a huge 142 per cent burst in views this week. The streamer has had a few weeks off and made his return on November 24th. 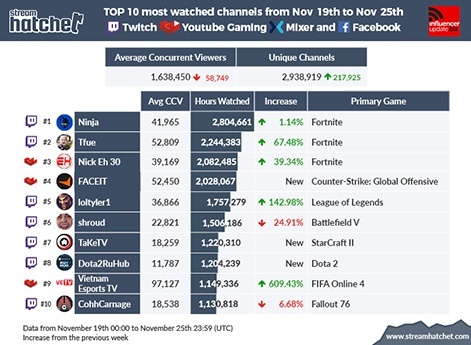 Shroud is down to sixth after a 24 per cent decrease in views, closely followed by new entry TaKeTV at number seven. Twitch channel Dota2RUHub is in eighth place, again as a result of Dota 2 coverage trailing off. 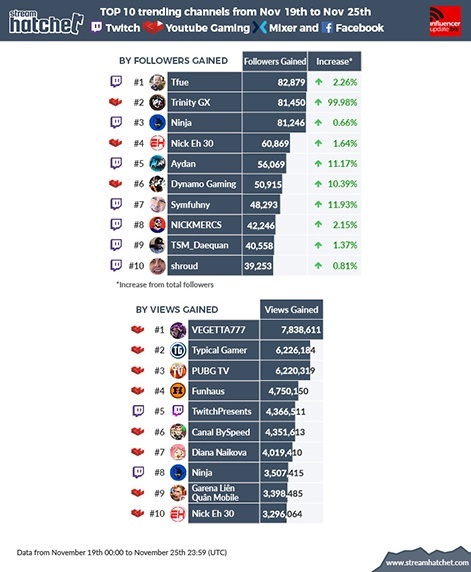 This week's followers chart is led by Tfue, who also made second on the most watched chart. The Fortnite streamer racked up over 82,000 followers in the last week. YouTube channel Trinity GX is a new entry also, racking up 81,000 followers in a week. Other entries include Twitch channel Aydan, who topped last week's trending by views chart, and Fortnite streamer Synfuhny, who has racked up over 48,000 followers this week. That amount is 11 per cent of his overall follower count. YouTube channel VEGETA777 is topping the trending views chart this week. The gaming channel is already well established with over 24 million subscribers, but its recent foray into streaming has caused a large spike in views. A 7.8 million spike. Other entries this week include Typical Gamer, who came fourth in last week's trending by views chart, and YouTube channel Garena Lién Qúan Mobile, a Vietnamese channel providing coverage of the Arena of Valor international championship.